Code expires 14.08.18 at 23:55. 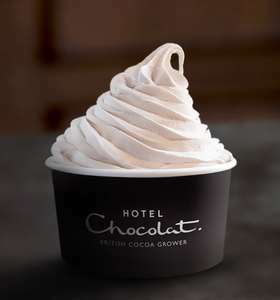 One free Hotel Chocolat ‘Ice Cream Of The Gods’ Tub. All details of participating locations and how to redeem on link. The Gods had poor taste in ice cream if this gritty, flavourless mess is anything to go by. No Costa coffee? Maybe Friday? No point having a new deal for this, the original OP will just extend the start date of the original deal. The only time I've ever 'bought' their chocolate is by buying loads of the Waitrose bars at £1 each and swapping them. The only time I've ever 'bought' their chocolate is by buying loads of the …The only time I've ever 'bought' their chocolate is by buying loads of the Waitrose bars at £1 each and swapping them. I didn't eat part of them, felt uncomfortable giving them a half-eaten bar as the staff were reluctant to do the bar swap anyway - most don't even realise it is still running. I have eaten some of the Waitrose bars and they are really nice too - I've got 1 bar left and I'm not sure whether to trade it in or eat it! It's going in the bin, they did this as a massive PR stunt - I doubt many people actually traded in their bars though. Hot! Simply because you posted it, when it was actually a deal and not pre-empting everything. Also, because it's free and tasty. Once again, I'm getting tired of pre-posts because on loose information, just so people can try to get to the top of the hotukdeals ladder; which really doesn't meany anything. I hope the MODS are seeing this and will clamp down on it. No point having a new deal for this, the original OP will just extend the …No point having a new deal for this, the original OP will just extend the start date of the original deal. Costa has silently moved to Friday now for some reason, though we had a random Monday one the other day. Costa has silently moved to Friday now for some reason, though we had a …Costa has silently moved to Friday now for some reason, though we had a random Monday one the other day. Are you sure Costa is on Friday? No I am not sure, that's why I didn't post it as a deal. Last couple of months it's been Friday only not Wednesday until Friday, check previous threads if you want an impartial view on this. I could just about taste the cacao infusion and that was the problem, it didn't really taste of vanilla/milk/cream or of chocolate. Just a weird inbetween flavour. As others have said, its not the best ice cream, if it was just the jersey cream milk without the cocoa infusion it might have a nice creamy flavour but all the cocoa adds is a tiny bit of not really chocolate flavour that doesn't quite work. I could just about taste the cacao infusion and that was the problem, it …I could just about taste the cacao infusion and that was the problem, it didn't really taste of vanilla/milk/cream or of chocolate. Just a weird inbetween flavour.As others have said, its not the best ice cream, if it was just the jersey cream milk without the cocoa infusion it might have a nice creamy flavour but all the cocoa adds is a tiny bit of not really chocolate flavour that doesn't quite work. Exactly. And they call it 'ice cream of the gods' . Who knew gods were so easily pleased! Sure, it's low-sugar and yes, it's free, that's why I put up with it. If I were paying I'd rather something rich and flavoursome like Thorntons or even a McFlurry which doesn't pretend to be anything it's not! Exactly. And they call it 'ice cream of the gods' . Who knew gods …Exactly. And they call it 'ice cream of the gods' . Who knew gods were so easily pleased! Sure, it's low-sugar and yes, it's free, that's why I put up with it. If I were paying I'd rather something rich and flavoursome like Thorntons or even a McFlurry which doesn't pretend to be anything it's not! Did the gods squirt their salted caramel topping on your ice cream? It was the only bit I enjoyed. It's going in the bin, they did this as a massive PR stunt - I doubt many …It's going in the bin, they did this as a massive PR stunt - I doubt many people actually traded in their bars though. Did they actually? That's messed up so they didn't donate them or anything? Did the gods squirt their salted caramel topping on your ice cream? It was …Did the gods squirt their salted caramel topping on your ice cream? It was the only bit I enjoyed. Yes they did and there wasn't enough of it to be honest! The dark chocolate baton was also nice but you don't always get that I notice. Agree.The ice cream is some of the worst i have tried. and the chocolate piece put in it tasted horrible too. And im a huge ice cream and chocolate fan. I'm not going to have the chance to use my hotel chocolat OR the costa coffee (if it does come out on friday)....does anyone want to swap with anything? I'm suprised they've kept it on in Edinburgh during August, but they've put on an offer dishing these out for £2! It was OK, the sauce and choc shard were decent enough and plentiful ice cream. HOWEVER - the staff advised they need to press the USE NOW button on the day, you can't activate it beforehand. They were all "I'll let you away with it this time" about it. Sorry if it's not a unique code (don't know if it ran out) but I hit the button before I went in to save time/internet connection! I've read they want to see no screenshots but this was pathetic. Not worth the hassle of going again and risking it running out. I didn't bother posting because I thought the OP of the previous one should have just extended it and HUKD would have pulled it off anyways - oh well, doesn't matter. The offers have been a bit of a let down for sure - but hey its free so can't complain much. Was hoping for Pizza or Cineworld this week ..